Season 5 of Flipping Out begins TONIGHT on Bravo! Watch Jeff, Jenni and Zoila along with Gage, Trace, Jett and Sarah juggle the dramas of house flipping/remodeling in Los Angeles. OMG OBSESSED! 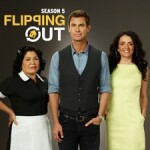 Flipping Out airs on Wednesday nights at 9/8 central on Bravo and moves to Tuesdays beginning July 12th.